Did Microsoft shoot itself in the foot, or does it have a master plan? A statement from the software giant's camp says that the company received interest "across the board" from stateside carriers about offering the Microsoft Lumia 950 and Microsoft Lumia 950 XL. But Microsoft said that it decided to narrow its channel strategy in the short term, and widen it in the long term. 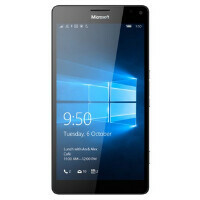 As a result, among U.S. carriers, AT&T alone will offer the Lumia 950 in the U.S. Unlocked versions of both models will be available from the Microsoft Store. Reportedly, AT&T decided on offering only the Lumia 950, since it believes it to be the easier sell among the two models. There is talk that Microsoft most likely never wanted to spend the money necessary to provide CDMA versions of the handsets to Verizon and Sprint. And as noted by T-Mobile CEO John Legere in a tweet, Microsoft simply gave the phone to AT&T. In other words, T-Mobile did not turn down the opportunity to add either or both of the two new high-end Lumia models to its lineup. One theory is that Microsoft intends to push the Lumia 950 to enterprise users in the U.S., and does not plan on spending too much money to market it. Instead, the speculation is that Microsoft CEO Satya Nadella and Surface VP Panos Panay want to reset Microsoft's mobile division, ridding the unit of anything that reminds them of the previous regime, including Lumia phones. Behind the scenes, Panay is rumored to be working on a Surface phone that would include PixelSense pressure sensitive touch inputs. Remember something else. Microsoft makes more money every year from the Android patents it licenses, than from selling its phones. Toss in last July's huge write-off of good will from the Nokia acquisition, and you can sense that Nadella and Panay are itching to clear the decks to start their own legacy when it comes to Redmond-based smartphones. Marketing and availability have always been Microsoft's achilles heel, especially the former. Having a superior product is just not enough to sell, especially in the United States. Microsoft just killed windows phone. The best show out of Google, Samsung, Motorola, LG, Sony and Apple all year and they had to make such a stupid move like this. This is not 2007. There's zero reason to do this. Yes, Windows Phone has been abandoned in favor of Windows 10 Mobile. At this stage what's the difference? Their using failed old school tactics that won't work for the platform in the long run. Why would developers create content when a good number of people won't have a chance to use the phone? Microsoft has doomed the platform again. because once its a universal app, which all apps when you start developing for windows 10 default to in visual studio when you fire it up, it wont matter the platform. And if you use the simple elegant adaptable UI code, then why care. The only time it matters is when the power of x86 is needed, which for 99.9% of todays people fall into. Going forward who knows, since it can be used on intel chips, at some point MS can simply use Continuum to run x86 apps while in doc mode and mobile apps when not in dock mode. So its far from dead, if anything this OS has the most to gain. What a MASSIVE disappointment. I showed this phone to my wife and to friends, very interested in giving it a try, especially with continium. This was a great opportunity for MS to really move forward with their phones and push the integration with windows. Who is in charge of marketing for MS? What a cluster-f$#@!!! I was truly excited about this phone! But we screw it up cause fork you. The Lumia 950 and 950 XL are just left over pipeline devices from Nokia they just want to get rid of and finish off before rebooting their mobile division? So the real "Windows" phone flagships will actually be the next phones they release supposedly renamed to Surface phone? If true, I do like renaming it to Surface as it more uniform with their product line, but now we'll have to wait until next year's flagships to see the true reboot of Windows smartphones. This was the last chance that I had for them. Microsoft is living in a different reality and when they see that it does not work out as planned then it will be too late; again. I really thought this new CEO was good. I know see Blackberry overtaking them in phones sales with their Android device (if they don't make the same boneheaded move). And will it work on all carriers like they will? No, because Verizon and Sprint use antiquated CDMA technology which is much more expensive for manufacturers to make phones work with. AT&T, T-Mobile and the vast majority of the world uses GSM. Yet phones like the Nexus 5X, Nexus 6P, Nexus 6, Motorola X Pure and the unlocked iPhone 6S can work on all carriers with no problems. The tech is there to do it. We've had phones for over a year with all US carriers supported with cost not a factor. No excuse for Microsoft not to do it. So the Nexus 5x that starts out at $385, the XPE starts at $400, and the Nexus 6p that starts out at $500 can all manage to put out phones that have that functionality at that low price. Yet the 950, which starts at $550 and the 950XL at $650 from a company like Microsoft, can't make that happen? You've seriously got to be joking, there is no excuse for that. If you truly believe that they did it as a cost cutting measure and their phones still cost that much, when in reality they have about the same hardware as the competition, then you're delusional. These phones have far more hardware features, iris scanning, 20MP pureview camera with 5th generation OIS, removable battery, microsd card slot, QHD screen, polycarbonate body(which is more expensive and a far better material than glass or aluminum, it doesn't scratch, dent, ding or crack like they do, it doesn't block RF like aluminum). None of those phones have anything close to approaching the continuum feature. These new phones also have liquid cooling, which, again, the phones in your comparison doesn't have. These new phones have a much more secure and efficient OS. The price is completely justified. CDMA is an unnecessary expense, especially when Microsoft has made a phone specifically in the past for Verizon and then Verizon screwed them over by pulling the product from the shelves shortly after. You want to blame someone for these phones not working on a specific carrier? Blame the carrier, they chose to screw microsoft over in the past and they chose to build their network on antiquated technology. Verizon can f**k off. They lie about having the best coverage anyway. Their own map is a lie and then they put up false representations of AT&T's map, T-Mobile's map, and Sprint's map. Verizon is the least honest carrier and they attempt to deceive the public. I worked on cellphone tower sites for well over a year, Verizon's standards are much lower when it comes to installing equipment than AT&T's. That's all well and good, but if you can't use it on your network, what good is it then? It's like having a Bugatti Veyron with no wheels. For all their advancements you mentioned, they couldn't match something that's been around for awhile now on iOS and debuted last year on Android? And by the way, you keep saying Verizon screwed over Microsoft by pulling the Icon quickly from the shelves. It was out for sales for 8 months, if it can't sell in that time, WTF should they do about it? Eight months is plenty of time for a device to be available if there's a market for it. If there isn't a market for it, that's 7 months too long. PDAdb.net doesn't list the phone as having CDMA radios, so it probably won't work on Verizon, sadly. Cool accessory idea: external Verizon radio. Put your Verizon SIM in the external radio, plug it in via USB, and BOOM, now your phone works on Verizon. https://onedrive.live.com/?id=5742E4DAAE5A3663%21669647&cid=5742E4DAAE5A3663&group=0&parId=5742E4DAAE5A3663%21669642&authkey=%21AJKSON8fkThABQ8&o=OneUp it does have cdma bands though... maybe just not the verizon specific bands. also it has some of the verizn lte bands the problem is the authorization. even if unlocked verizon would still need to authorize the phone and zerizon doesnt support windows phone at all. Those bands are WCDMA, which is NOT the same as CDMA. And those LTE bands may not be in the same blocks as Verizon's LTE operates in. excellent article, a very clever look behind the curtains as to what is actually being set up here by MS. Well done author. If they're going to reset their smartphone line next year with a "Surface" phone then I'm excited seeing as how the Surface Book and Surface Pro are nice devices. It's just a shame we have to wait until next years flagships to see them. As an unlimited data user I'll definitely be benefiting myself from the continuum, haha legal unlimited tethering and violating the terms of my contract, here we come! "Microsoft said that it decided to narrow its channel strategy in the short term, and widen it in the long term." What boatload of crap! It's simple for me. Sold by T-Mobile where I can pay an easy $30/month or a no buy for me. I bought the Lumia 920 and 1020 and a ton of other ATT Windows Phones to use on my carrier. I feel I more than paid my dues. I really hate this move and I'm glad John Legere brought attention to it. misleading title. this read more like an opinion piece than actual news. microsoft said that they werent going to put antiquated cdma radios in their devices and probably wont spend the resources to offer sprint or verizon special phones... which they probably would eol in three months. tmobile is probably the biggest hypocrite. they dont support windows phones at all. wp are also eol really quick on tmobile. the only actual company that gives two shets about wp is att which is why microsoft went to them first. microsoft said that it is annoyed with the fact that carriers dont update the devices. thats why they will offer them unlocked at microsoft stores. some lumias are still stuck on amber and demin was released so long ago. americans have the bad practice of buying sudsidized phones. they dont understand that it is actually cheaper to buy it outright. which is what almost every other country does.